That must be very new – I was using the tool last night and still had the green bars. Me too Nicola, I hope it doesn’t roll back! Oh wow, that is a huge development. First Google takes a big bite out of services like Compete with new Google Trends features, now tools like WordTracker better watch their back. Oh well, now it’s time to go do some *real* keyword research! I was excited when I saw the news, but when I’ve checked I’ve saw really inaccurate results. I know a few terms that I rank #1 in Google, and what they show compared to what I get is not even close. Make sure you change the drop down menu from Broad to ‘Exact’ after your search and you should get good data. Great! Looks like a bit of rounding is going on though, where several different keywords have the exact same search volume, all ways round numbers too! This is just plain AWESOME. This makes my life exponentially easier, I’ve been asking for this for ages!!!! I’ve compared it to the numbers from WordTracker and KeywordDiscovery and both of them show FAR less searches than Google’s tool. So what is one to believe? I mean… Google must know their numbers right? Its obvious to believe google because they have the real stats. Now after having spend a little more time with the tool I am wondering why they are showing “approx. searches”. I would imagine that they were able to give exact numbers easily. But that might be sharing too much? It’s about time. I’m using a great software wtih WebCeo for this kind of research. But Google Keyword Tolls is a very short way to give a look. A good look by area and language. Yahoo! From my early comparisons against adwords impressions, it’s pretty accurate as well. 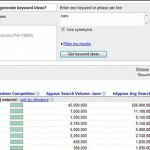 Makes keyword research pretty easy. Dont forget to uncheck the “Use synonyms” under the search box this will give more accurate results! Why is that Neale? Won’t them terms still be the same? I was very excited when I first heard about this. I’m interested now to see what the paid providers (wordtracker, wordze etc) do next. I can’t wait to see who will first send out a tool that calculates KEI and R/S ratios. That could be a cool viral tool. I am not sure how much difference this is going to make. This is being discuss all over the blogosphere. It wasn’t showing until 4 days ago for me. It is definitely a big plus. I am looking for some advice on the Google tool, I wonder if you can help. I often search and there are 1000’s of results displayed in the Approx Avg Search Volume column yet the data from the previous month is “Insufficient Data”. This does not make logical senses to me as how can there be no search volume (Insufficient data) during previous months if there are 1000’s on an average month. There would be natural surges in new terms & products that would show insufficient the previous month. However the tool is still to be used with great caution and not solely relied on. @Goran, that is a very good question. I have been wondering that myself but so far I haven’t heard or read an explanation. Another “strange” thing is that you can find keywords with very high CPC prices while the advertiser bar shows that no one is bidding on the keyword. How does that make sense? 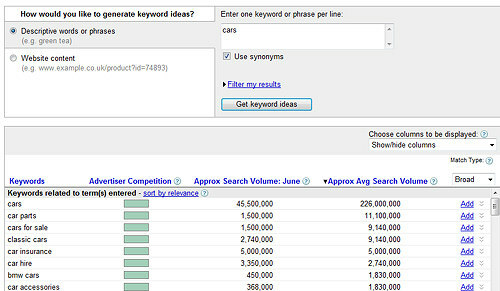 @ Scott I used to use a host of other keyword tools of which most of them did not cater for South African searches. What tools would you recommend. @ Mikael I have had that happen to me on multiple occasions. Its really irritating. I use the editor as it is faster and only realise that this is the case once I am close to finished. I purchased Brad Callen’s latest version of Keyword Elite 2.0, but have been soo busy I haven’t had a chance to use it. I have all of his products and I’m very excited at the thought of making the time to learn and apply the new additions to the software. I just wanted to know if anyone has used the new version and if so, what do you think about it and what kind of results did you get? Let me know your experiences.